We stayed Friday night in Leadville at the Columbine Inn, dining on fine Mexican food at "The Grill". The following morning, we distributed the communal food and left the hotel around 8:30am. The trailhead to Uncle Bud's Hut is just on the other side of Leadville, so the drive took us only about 10 minutes. The trailhead parking is on the east side (left, if you're heading south) of County Road 99 - it's well marked and has a pit toilet available. (Don't turn right as it's a tiny parking area for the snowmobile and dogsled outfitter there). Unfortunately, we took the wrong turn towards the outfitters and in the process of turning around someone's car got stuck -- so we didn't really hit the trail until about 9:30am. Everyone carried their gear across County Road 99 and threw their snowshoes and skis on at the start of the Road 127. We started as one group, but the 14 of us quickly split into three smaller groups based on hiking speed -- we kept in contact via three FRS radios to ensure no one missed a turn. Road 127 and 104 are heavily used by snowmobiles, but it was also groomed by a snowcat making it very easy to follow and smooth for skiing or snowshoeing. Most of the snowshoers in our group (and one skier) chose to boot-pack on the road, as the grade was very gentle and the snow very supportive. After 0.6 miles, we turned right to continue on Road 104 (turning left would have taken us around the other side of Turquoise Lake towards Hagerman Pass). There were occasional snowmobile tracks and side roads that led off the main path so it was important to follow the map or GPS through the first mile or so. The road gradually climbed up and occasionally offered views of Mt. Elbert, Mt. Massive, and Turquoise Lake through the trees. The turn-off to Road 107 was very well signed and obvious. Snowmobile tracks traveled in both directions so both trails were well packed. Many folks in our group that were bootpacking opted to put on their snowshoes here as the snow was a bit softer and less supportive. The trail also started climbing much more significantly at this point. There were a few side trails departing from Road 107 that you could easily wander off following if they were tracked - when we hiked, however, these had untouched snow so the route was obvious. After climbing for 1.2 miles on Road 107, the trail started to descend a bit giving some relief to our legs before the trail broke from the road towards the hut. This can be an easy turn to miss if the trail isn’t broken: the snowmobile tracks continue off to the left following an orange tree blaze and the hiking trail climbs up to the right following a blue tree blaze. Both diamonds were visible at the trail cutoff point (on different trees) but it could be an easy turnoff to miss. This turnoff is less than ¼ mile from the hut itself and climbs steeply. One skier’s kicker skins were struggling to provide enough sticking power to get her up the slope. The climb is short and levels off just before arriving at the hut itself which isn’t visible until you’re basically on the front porch. The climb itself (about 1600 feet) isn’t as significant as many other huts in the 10th Mountain system, but the 6 mile distance still wears your legs down -- I’d say nearly every person in our group was feeling it by the time they reached the hut, but everyone made it with no issues. The hut is nearly identical in layout to 10th Mountain Division hut, including the deck positioned on the south east corner and a bank of windows looking out to the south. The view from the hut is probably one of the best in the 10th Mountain’s networks: an unobstructed view of Mt. Massive and Mt. Elbert and down the Arkansas River Valley. Couple this view with some fantastic nearby skiing and this hut has probably become one of my favorites! The kitchen has 4 propane burners, a wood burning cooking stove, a cistern pump for dish water, two sinks and plenty of dishes/cookware (including a giant cast iron dutch oven). The living area has two picnic tables, a wood burning heat stove, and two large seating areas around the stove. Upstairs, there are two bedrooms (sleeping 4-6 each) and a main room that can also sleep 6. Out the back of the hut there is the wood room, a cold storage room, and two outhouses of a short wooden walkway. We spend two nights at the hut with one communal breakfast and two communal dinners. The volunteer for meals purchases all of the ingredients (for which the group reimburses them) and then all of the food (and weight) is distributed through the entire group to carry up. It was quite windy up at the hut so many chose not to venture too far from the hut to explore. Most hiked up the ridge behind the hut (to the north) towards the top of St. Kevin Gulch (the ski hill) to enjoy a great view of the Mosquito Range, Arkansas River Valley, and the Sawatch Range. Three ambitious hikers ventured up to Point 12,313 to obtain a wind-blown summit. The skiers/boarder ventured over to St.Kevin Gulch which is ¾ miles from the hut with about 200 feet of climbing. In addition to the phenomenal views offered, there was a very wide expanse of low-angled, lightly tree-d terrain. As an added benefit, the entire slope was sheltered from the westerly winds that were pounding us at the hut. We chose to ski a slope that was about 18° (relatively safe from an avalanche perspective) down the center of the valley. It was clear, however, that there was a lot of good skiable terrain here! The primary slope offered about 210 feet of vertical drop with a good spot to stop, re-skin, and climb back up. We made three laps on our off day then, for good measure, came back for a sunrise view and one more run on the day of our departure. For our return to the hut, we skied down a total of 320 feet before we found a skin track at the bottom of the slope that eventually reconnected with our initial ascent track on the ridge to bring us back to the hut -- there may be a more direct route to the hut that didn’t involve as much re-ascending (we climbed 160 feet back but then dropped 70 feet back to the hut) but we didn’t want to break our own trail and bushwhack. For the descent, we let the snowshoers head out about 20 minutes prior to the skiers -- we wanted to ensure we didn’t get jammed up on the trail if the skiers had to re-skin along the way. This delay ended up being just about perfect, as the skiers caught up to the slowest snowshoer group just as Road 107 joined the wider Road 104 (with plenty of room to pass). For the skiers, the descent was a mixture of steep, fast terrain and flat skinning terrain. The skiers started with skins on from the hut -- it was flat-ish for the first ¼ mile or so and the skins just made it easier to travel. We stripped our skins off before the first steep descent. We slowed ourselves primarily by bailing off the trail into the untracked snow and trees making the descent pretty fun -- it was early February and the snow off the trail was very soft and slow; had this been a warm March morning, the snow might have been crustier offering a bit more of an “exciting” descent. Once we rejoined Road 107 we continued to follow the narrow trail and snowmobile tracks, bleeding off excessive speed by skiing into the untracked side of the trail. The trail flattened out a bit in between some of these fast sections but the flat spots were short enough that the skiers could pole in between them (it was too narrow to skate-ski) -- the splitboarder opted to pop out of her bindings and walk the short flat stretches. We encountered a flat spot after 0.9 miles and opted to re-skin for about ¼ mile before stripping the skins and descending all the way down to Road 104. The wide road initially offered a good angle for skiing (and plenty of room to skate-ski if it flattened out) but eventually gave way to a number of flat or even uphill sections. The splitboarder used poles to get through some of the shorter flat sections, but eventually gave up and just carried her board and walked. The skiers did a mix of skate skiing, skinning, and just plain walking with skis on our packs as we gave up on the constantly changing angles. 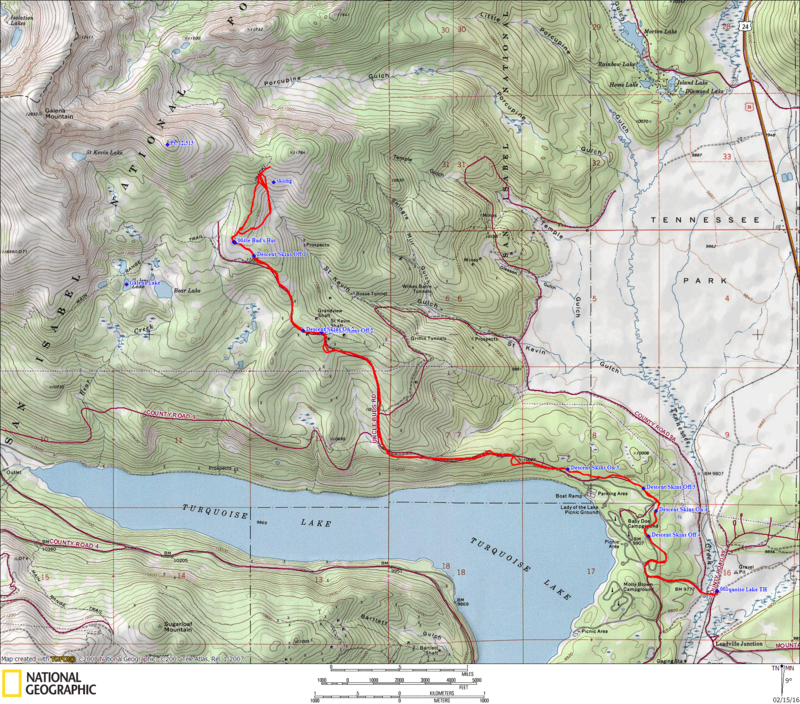 The map image below (and GPX file) has indicators of where we skinned, skied, and just plain walked. This made the final portion of the road a bit more tedious, but it was still a beautiful day and we’d had such great skiing that we didn’t mind too much.